Size: 183cm x 61cm (72inch x 24inch), 6mm Thick. Available in Pink, Green, Blue, Purple and Black. JLL is pleased to introduce our lightweight, Non slip Yoga/ Pilates Mat in an array of colours. 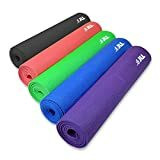 Designed for enduring performance and stability the JLL Yoga Mat provides a comfortable soft cushion to help protect your knees and bottom from the hard floor when completing exercises. The Yoga/ Pilates Mat has a closed cell surface which prevents perspiration from seeping into the Mat and breeding bacteria. PLEASE NOTE: For Health & Safety reasons, once the cellophane packaging has been removed from this item, it will not be possible to exchange or refund this product.